Imperii Magni Mogolis sive Indici Padschach, juxta recentiissimas Navigationes accurata delineato Geographica studio et sumtibus. Representing 18th century Germany cartography at it's finest; this is an absolutely spectacular c. 1740 map of northern India by Matthias Seutter. 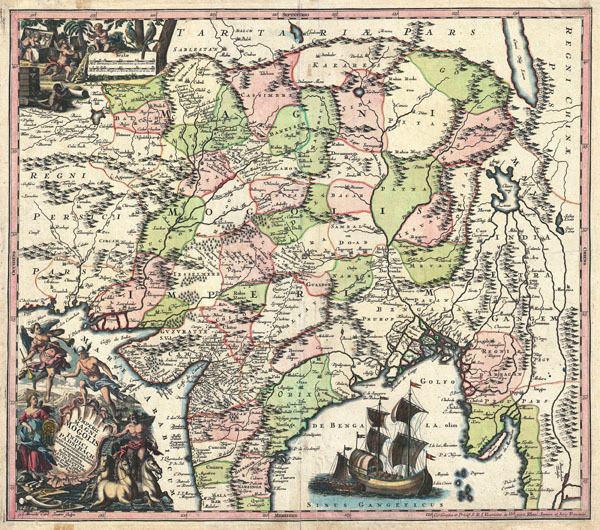 Showing the extent of the powerful Mughal Empire in the late 17th century, this map details the subcontinent and parts of Central Asia from Persia and Khandhar eastward as far a modern day Burma and Thailand. Extends northward to include parts of Tibet and Nepal and southwards as far as the Malabar Coast and the Gulf of Thailand. Cartographically this map is heavily based upon Hondius and Mercator's 17th century of the same region entitled India Orientalis. Presented is wonderful combination of surprising accuracy, gross errors, and outright speculation. Generally speaking, this map is cartographically solid detailing numerous cities, river systems and trade routes. Shows Deli, Agra, Kandahar (Candahar), Lahore (Lahor), Pegu, Goa, Kabul (Cabul), Jaisalmer (Gislemere), and many other important and still thriving cities. Also notes several important trade routes including the ancient caravan trail westward from Agra into Persia. Despite this map's thoroughness, there are a number of cartographic errors, probably the most notable of which is the narrowing of the subcontinent. Usually such lateral misrepresentations are the result of erroneous 16th century longitudinal calculations. In this case, these errors found their way into the Hondius's map and hence into this one as well. The northernmost regions depicted on this map are highly speculative with regard to physical geography. A number of large lakes, including the apocryphal Lake of Chiamay, are speculated in the northeastern quadrants of the map as the sources of four important Southeast Asian river systems including the Irrawaddy, the Dharla, the Chao Phraya, and the Brahmaputra. The curious Lake of Chiamay (also called Chiam-may or Chian-may), roughly located in the area of Assam but sometimes as far north as Tibet and China, began to appear in maps of this region as early as the 16th century and persisted well into the mid 18th century. Its origins are unknown but may originate in a lost 16th century geography prepared by the Portuguese scholar Jao de Barros. It was speculated to be the source of five important Southeast Asian River systems and was mentioned in the journals of Sven Hedin. There are even records that the King of Siam led an invasionary force to take control of the lake in the 16th century. Nonetheless, the theory of Lake Chimmay was ultimately disproved and it disappeared from maps entirely by the 1760s. Decorated with several extremely attractive allegorical cartouche image. The title cartouche in the lower left hand quadrant shows Poseidon, Hermes, an angel and the goddess Fame admiring the wealth of Asia as represented by jewels, ivory, and precious metals. In the upper left hand quadrant, a distance scale plays second fiddle to a scene of cherubs rummaging through chests full of treasure while exotic peacocks look on. A large trade Caravel rests in the Indian Ocean, lower right quadrant, suggesting the trade riches to be had by daring ship captains willing to sail half way around the world. Engraved by Albrecht Carl Seutter and published by Matthias Seutter c. 1740. Very good condition. Original centerfold crease exhibits minor wear. A couple of minor verso repairs largely limited to marginal areas. Else clean. Blank on verso. Original platemark visible. Gole, S., Early Maps of India, #45. Biblioteca Nacional de Portugal, 319455. Gole, S., India Within the Ganges, 60:1:1.